The Georgia Department of Natural Resources owns the Hike Inn, and the inn is operated by the non-profit Len Foote Hike Inn, Inc. - an affiliate of the Georgia Appalachian Trail Club. The inn opened in November 1998 and sits at an altitude of 3,100 feet. The surrounding area contains mountain laurel, rhododendron, and oak and hickory trees. Conservation, environmental stewardship and environmental education are stressed at the inn. The facility contains solar-powered hot showers, photo-voltaic solar energy and compostable, odorless toilets. Communal breakfast and dinner meals are included with the stay and are served family-style. Visitors are encouraged to minimize their food waste during meals, and leftover food is composted via a vermiculture program. The Hike Inn can only be reached by foot. The approach trail to the inn from the south starts at Amicalola Falls State Park in Dawson County, Georgia and requires a five mile hike. The first .35 miles of this trail to the inn is also part of the approach trail to Springer Mountain, the southern terminus of the Appalachian Trail (AT). Thru-hikers for the AT often start or end their journey at the Hike Inn. The trail to the Inn continues northward past the facility for approximately one-mile to reconnect to the AT approach trail. The trail from Amicalola Falls to the Hike Inn is marked with lime green paint blazes. The rise in elevation during this hike is 500 feet and is listed on park literature and signage as an "easy to moderate" hike. Also located on the grounds of the inn is a granite celestial calendar formation that aligns with the rising sun during the spring and fall equinoxes. The Star Base was designed by Fernbank Science Center in nearby Atlanta . Wikimedia Commons has media related to Len Foote Hike Inn. ^ a b c d e Ress, Thomas V. (April 30, 2002). 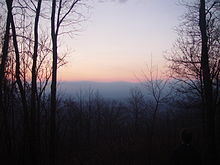 "At the Foot of the AT: Len Foote Hike Inn Trail". Great Outdoor Recreation Pages. The Away Network. Retrieved 2014-04-10. ^ a b c Antman, Carol (December 27, 2013). "In The Footsteps Of Len Foote". Island Eye News. Retrieved 2014-04-10. ^ "Great inns open only to those with good hiking shoes: Len Foote Hike Inn". Mother Nature Network. MNN Holding Company, LLC. Retrieved 2014-04-10. ^ a b "Presidential Ponderings" (March). Georgia Appalachian Trail Club. 2014. Retrieved 2014-04-10. ^ "Hike Inn Trail Map". Len Foote Hike Inn. ^ a b Veal, Jenni Frankenberg (2013). "ESCAPE: To a Georgia Hike-In Lodge". Sierra Magazine. Sierra Club (Sept/Oct). Retrieved 2014-04-10. ^ Dorsett, Katherine (April 19, 2011). "Five lodges you can't reach by car". Cable News Network. Turner Broadcasting System, Inc. Retrieved 2014-04-10. ^ a b Hardwick, Phil (January 16, 2014). "Nature Tourism, The Hike Inn way". Mississippi Business Journal. Retrieved 2014-04-11.